This was a small live featuring three groups. Itou Asuka was one of the performers, and she told me that she would be the last performer at around 21:00, so I went after work. This was my first singing event in 15 months! I arrived around 21:00, and Asuka's stage had already begun. I missed her first song. There were less than 20 people in the crowd. Asuka was wearing a white shirt and checkered skirt, with black "over the knee" socks. She looked like a high school student. Asuka's stage was as follows. 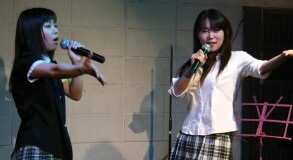 Asuka invited her friend Natsume Kumi (a seiyuu in PC games), and they sang two songs together. Asuka's theme for this event was CoCo, so all of her songs were CoCo songs. Asuka's stage lasted for around 30 minutes. I used my 20D and 24-105mm F4L IS and 50mm F1.4 lenses, and took 427 photos (ISO1600), with 154 of them worth keeping.